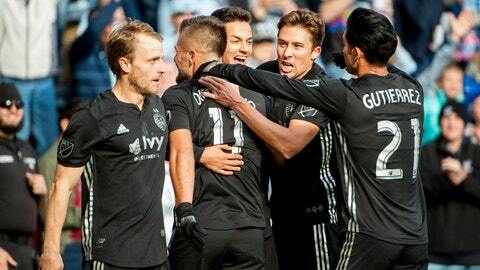 KANSAS CITY, Kan. — Daniel Salloi scored two goals and Sporting Kansas City beat Real Salt Lake 4-2 on Sunday for Sporting’s first playoff win in five years. It gave Sporting KC a 5-3 series win on aggregate to advance to face the Portland Timbers in the Western Conference finals, also a two-game series. Sporting KC scored two early goals in the first half for a 3-1 aggregate lead. Diego Rubio opened the scoring in the 14th minute with an easy finish of Felipe Gutierrez‘s unselfish pass. RSL nearly tied it three minutes later but Tim Melia denied Damir Kreilach‘s close-range attempt. After an RSL turnover, Gutierrez rolled it through the middle of the defense and Salloi chipped it over goalkeeper Nick Rimando. Sporting KC’s second-half scoring came on Ilie Sanchez‘s penalty kick for a 3-1 lead and Salloi’s tap-in into an empty net in stoppage time.